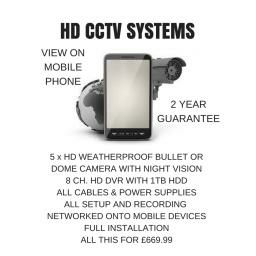 Roadcamera UK supplies and installs CCTV security systems. We have built up an extensive knowledge over the years from designing bespoke CCTV systems to CCTV installations and fault and problem solving. We can supply and install domestic CCTV systems or design, supply and install a more complex system to protect your family and business. All CCTV cameras can be networked and viewed online with Mobile Phone, Tablets and PC Laptops.At Roadcamera UK we are offering a free local CCTV installation.